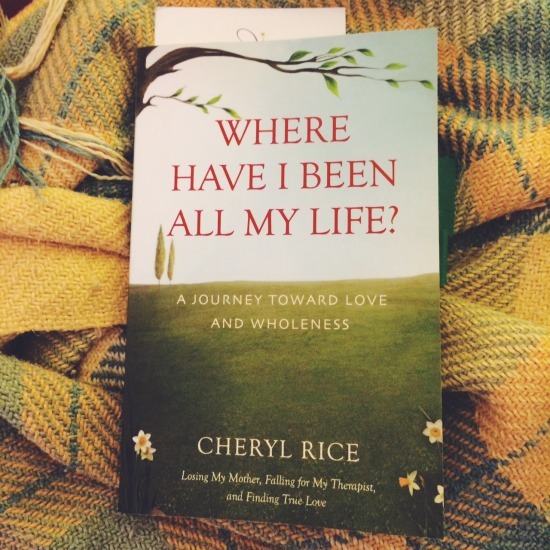 TLC Book Tours contacted me last month about doing a review of Cheryl Rice's book Where Have I Been All My Life? When I saw the tagline, "A Journey Toward Love and Wholeness," I knew I had to say yes. So they sent me the book, and I dove into Cheryl's journey while curled up on my couch. The overarching theme of Cheryl Rice's book is about how her mother's death and the grief that followed became the catalyst to finally beginning a deeper, more honest relationship with herself. This topic is one I know in my own way, as I've had that experience of grief cracking me open in unexpected ways and finding there are gifts inside the grief even as you deeply miss the other person...in finding that someone else's death gave me space to dive into my own journey in ways I hadn't before the grief. Ten days into my motherless life, and I know already that I am not going through grief - grief is going through me. I am not in charge, which is quite disturbing, since I like being in charge. Not only that, but while my mother left lots of lists for what and who she wanted taken care of after she died, the one list she didn't leave was the one telling me what to do with myself without her. One of the things I like about this book is that the path to this new relationship with herself isn't described as happening like a magic wand appeared one day and "aha!" Cheryl finally understood. Instead she invites us into her non-linear, messy, reluctant-at-times, raw adventure into finding a home inside her. This includes developing a crush on her therapist, trying to control something, anything, by controlling what she eats, and trying to literally find her mom in the places where she could be, like Cheryl's childhood home, and the experiences that are a result of this searching. She writes, "I was bobbing in a stew of grief and longing. My homesickness for my mom was unrelenting." Even though my mom is still alive, I could viscerally feel this while reading it. If you know grief, you've tasted this raw truth. Throughout the book, I like the way Cheryl invites us in with her conversational tone and realness. It reads at time like a journal, other times like a peek into a long conversation with a new friend with whom you instantly hit it off and you share everything over a three-hour lunch, and then it will read like pieces of a raw story you might hear at a storytelling evening at The Moth. She also shares some journal-like writing she did at the time, and the prompts she's used (shown by the title of the chapter) would be beautiful ones to write in your own journal. I love that even though this isn't a book with prompts in it, we get a peek at the creative, self-care processes this woman used to get through her grief. And she talks about reading Mary Oliver, so you know I love that. One of the criticisms I've read about Cheryl Strayed's memoir Wild is that it's about a woman who left her life in order to literally go on a journey to find herself, and how leaving our everyday lives to walk the Pacific Coast Trail isn't possible for most of us. Now, this book review isn't really the place for that conversation (though I do want to say that I found Wild highly relatable, and I think we champion Thoreau and other men who leave their "regular" lives but have a harder time supporting women who do), but there is a comparison to be made here. If you're looking for a memoir with similar themes to Wild - rebuilding your life after you're broken open by grief, realizing that you alone are the home you've been seeking - and you're looking for a protagonist who is living a life that might be a bit more similar to yours, then this will be a really good fit for you. And one of the best ways I know that I really enjoyed a book? When I'm sad to see the story end because I feel like I've met a friend with whom I really want to spend more time. People who are beginning the path of realizing they want to feel like they are enough and want to have a softer internal voice, and people going through grief experiences, often ask me for book recommendations. I'm delighted to add Where Have I Been All My Life? to my list. Note that while I was given this book to review, all opinions are my own and I did not receive compensation other than the book. And of course it is always fun to write a book review when you end up really enjoying the book. Book links are affiliate.